Big stars doing guest spots on TV shows can be pretty fun (it can also go horribly wrong, like Britney in How I Met Your Mother, but let’s try not to dwell). I was surprised by how much I enjoyed Gwyneth Paltrow’s turn in Glee as Holly Holiday, an itinerant substitute teacher, for example. Even more of a coup though is when television manages to nab a big screen star to permanently add some gravitas to the show. 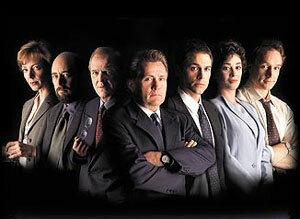 Martin Sheen (Catch-22, Badlands, Apocalypse Now) was originally only supposed to be in a few episodes per season of The West Wing– a gripping show about American politics- with Sam Seaborn (played by Rob Lowe) intended to be the main character. However Sheen’s President Bartlet became one of the leads, and really the focus of the show. The West Wing went on to win a ridiculous number of Emmys and other awards, and won praise from television critics, politicians and former White House staffers. It also featured Stockard Channing (Rizzo from Grease) as the First Lady Abigail Bartlet- and in later seasons Alan Alda (The Aviator), Jimmy Smits (the Star Wars prequel trilogy) and Broadway (and everything else) actress Kristin Chenoweth joined the cast. Glenn Close is best known for her film roles (Fatal Attraction, Dangerous Liaisons and 101 Dalmatians amongst them) but after starring in The Shield she chose to work on another television show. 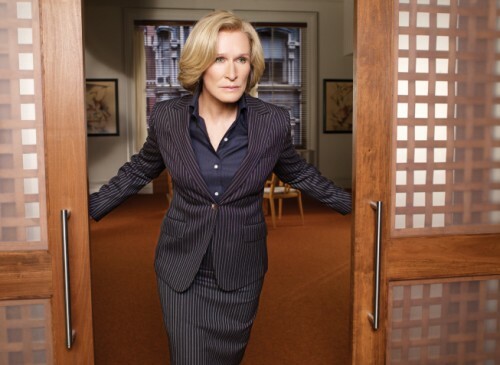 Damages is a complicated show centred around Close’s character Patty Hewes, a lawyer. There are myriad plot twists exposed to the audience through an addictive non-linear narrative. Ted Danson, who graduated to films like Made in America after starring in the sitcom Cheers, plays her first season nemesis Arthur Frobisher. Commander in Chief featured another movie star in the role of US President- Geena Davies (The Fly, Beetlejuice, Thelma and Louise), perhaps this kind of role naturally calls for the authority and screen presence of a high-profile actor. The show only ran for an 18 episode season, and garnered some criticism for focussing too heavily on the President’s gender- although perhaps the story lines would have broadened out if the show had gone on longer. 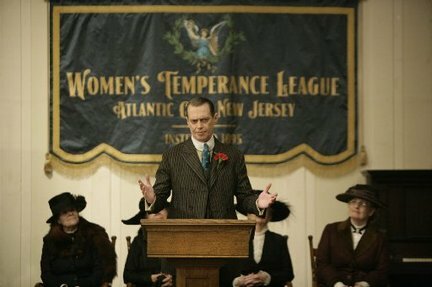 Steve Buscemi (Resevoir Dogs, The Big Lebowski, Armageddon) stars as Nucky Thompson, a corrupt Atlantic City politician, in the Prohibition-era Boardwalk Empire. The creator Terrence Winter had previously worked with him on The Sopranos when he joined the cast in the later seasons as Tony Soprano’s cousin Tony Blundetto. Boardwalk Empire (much like Carnivale– another HBO period drama set a decade later) is very cinematic, in some ways it doesn’t feel very TV show-like. Dead Like Me, a show about grim reapers, starred relative unknown Ellen Muth as the main character George Lass who becomes a reaper after the toilet seat of an exploding space station hits and kills her. Her mentor and boss, Rube Sofer, was played by Mandy Patinkin who is famous as a stage actor but perhaps most well-known, and best-loved, for his portrayal of Inigo Montaya in The Princess Bride. He went on to star in the first two seasons of Criminal Minds, a more-interesting-than-most crime procedural. 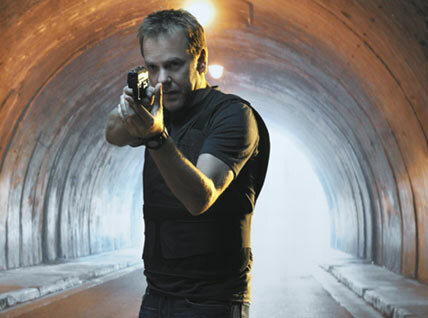 Practically everyone in the world seems to be familiar with 24, a gruelling show about the life of Special Agent Jack Bauer who has to race the clock to save America from terrorists and so forth, although I must admit I’ve never sat through an episode. Nonetheless even I know that the main character is played by Kiefer Sutherland, who was far more of a film actor before the show- due to appearances in movies such as The Lost Boys, A Few Good Men and Flatliners so I think he deserves a place on this list. Asides from Michael C. Hall as the titular serial killer who played David Fisher in HBO’s Six Feet Under, a lot of Dexter‘s cast seemed to be filched from Oz (Lauren Vélez; David Zayas; Erik King) but by season five there’d been enough branching out to include Julia Stiles as Lumen Pierce- a victim that Dexter discovers who goes on to become his mission, accomplice and lover. Stiles has done almost no television work and is known for film roles such as Save The Last Dance, both Bourne films and Mona Lisa Smile, as well as a swathe of Shakespeare remakes- 10 Things I Hate About You, Hamlet and O. She definitely added something to the latest season of Dexter which has seemed a little stale since the conclusion of its excellent first season and might have suffered from the loss of Julie Benz after her character Rita, Dexter’s wife, was brutally murdered. Aaron Sorkin’s follow up to The West Wing about an SNL-like sketch show was ill-fated, only running for one season. It started off incredibly strongly- if often as a thinly veiled rant against television networks, Sorkin’s conservative critics, his ex-girlfriend and just about everyone else- but petered off towards the end when it suddenly became a romantic comedy. When it was good it was great- with brilliant writing and entertaining guest stars. It starred Amanda Peet (The Whole Nine Yards) as President of NBS’s Entertainment Programming, and Matthew Perry and Bradley Whitford as the writer-director duo based on Sorkin’s relationship with Tommy Schlamme. Perry had moved into films after Friends, and had in fact co-starred with Peet in Nine Yards and its sequel. I know very little about Burn Notice asides from the fact that it stars Bruce Campbell (Evil Dead, Bubba Ho-tep, My Name is Bruce), and that’s enough to make me want to watch it. (Well that’s not entirely true, I also know that it was created by Matt Nix whom I love for his adorable Dallas buddy cop show The Good Guys.) It’s about “burnt” spies which sounds interesting, and I may need to start watching. Lie to Me is a procedural, a cut above the rest thanks to the interesting stable of characters led by Tim Roth as Dr Cal Lightman. It’s differentiated from the endless CSI and Law & Order style shows by focussing on cracking cases through the use of psychology- interpreting microexpressions and body language. The show is further differentiated from most other procedurals in that they don’t merely investigate deaths, widening the scope of the show to include many different kinds of cases. Roth is an established screen actor on both sides of the Atlantic with films like Rosencrantz & Guildenstern Are Dead, The Thief, The Cook, His Wife and Her Lover and Reservoir Dogs under his belt. Lie to Me features an almost unreasonably attractive supporting cast (even by television’s standards), which for the first two seasons included 8 Mile’s Mekhi Phifer. Cybill Shepherd’s career began with films like The Heartbreak Kid, The Last Picture Show and Taxi Driver, before she moved into television after some less successful movie roles. Moonlighting, a TV dramedy about private investigators, strengthened her career and launched Bruce Willis’ own. She appeared in other successful films like Chances Are but has become more of a television actress with her own sitcom Cybill followed by more recent stints on The L Word and Psych. 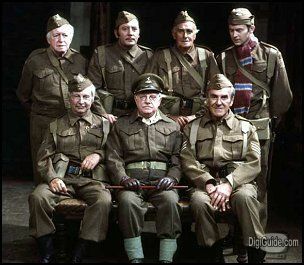 Dad’s Army was a British sitcom about the Home Guard in the Second World War- essentially they’re too old, too young, or apparently too allergic to corned beef to join the Army- which I spent far too much of my childhood watching. I’m reliably informed (as in, I had a conversation with my own dad) that several of the cast were veteran British actors. And it turned out he was right! Check out the overwhelming IMDb profiles for John Le Mesurier (Sergeant Arthur Wilson) and John Laurie (Private James Frazer) who appeared in so many films I’m not even sure what to highlight. Don’t worry, I’m not about to claim that the Dawson’s kids had stellar screen careers before the show (although let’s not knock Josh Jackson in The Mighty Ducks film). Instead I’d rather focus on the show’s creator Kevin Williamson. He’s perhaps best known for writing the Scream films, and while a series of slasher flicks might not immediately seem to have much in common with a rather more staid show about teenagers coming of age in a small town, I think Williamson’s trademark style definitely showed. Although the later seasons of Dawson’s Creek got pretty lame, the first few were characterised by tight, witty dialogue and a wry, post-modern knowingness. In the same way that the characters in Scream discuss- and therefore satirize- the conventions of slasher films, Dawson et al gently mock their own melodrama. The same thing which makes Scream my favourite horror film makes Dawson’s Creek (at least the early years) eminently watchable. Williamson seems pretty entrenched in TV these days, with his work The Vampire Diaries and talk of a companion show. 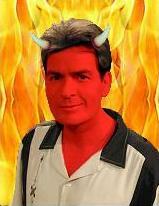 Dishonourable mention: I know that I ought to include Two and a Half Men given Charlie Sheen’s film career (Platoon, Young Guns, Scary Movie 3) but I hated his character in Spin City, and Two and a Half Men is downright awful. 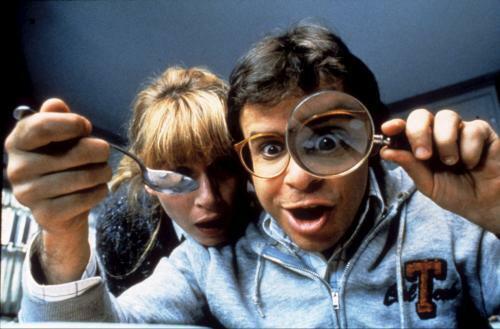 Do you have a favourite big star on the small screen? Tell us about it in the comments! Urghh I can’t bear two & a half men, especially since i learned he gets $800,000 per episode!!! Every irratating little half hour show = near $1mil for mr sheen!! Although i am always glad to see duckie from pretty in pink doing well. 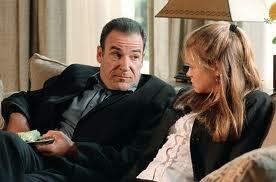 Pingback: Anyone miss Dead Like Me?